It became pretty clear, pretty quickly that Transat Tours Canada is set on growing its business in Europe – during both the upcoming winter season and on into the summer of 2018. In fact, Transat’s vice-president, national sales and commercial, Denise Heffron was quick to point out that in 2018, the operator will be featuring 28 destinations and will “not only be defending its number-one position in Europe,” but it will be on a mission to significantly increase that position. 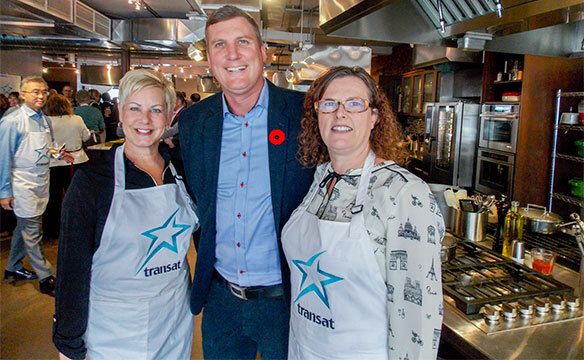 Heffron – speaking to a group of about 50 VIP, travel trade types at a presentation at Cirillo’s Culinary Academy in west Toronto last week – said that this winter, Transat has upped its Europe capacity by 19%; in the summer, the increase to Europe is 12%; and globally, the operator’s capacity has grown by 14%. She also made it clear that along with taking an aggressive approach to Europe, Transat has also renewed its commitment to further expose the Transat brand in Ontario, launching new television commercials in that market and returning to Toronto’s Dundas Square with a significant presence there. Nicole Bursey, commercial director for Transat, told the gathering that the company’s Europe product is growing – not by adding new destinations – as the operator strengthens its position in its key markets – increasing its capacity into the UK, Portugal, Israel, Spain, and Ireland. Those capacity increases, she said, are from Toronto and Montreal and the operator has also put more connector service in place from Western Canada to feed into those gateways. Heffron also took time to remind the agents on hand that “Cuba is 150% open and ready to host your clients.” And while she said she knows that those in the audience already know that Cuba’s good to go, the job now is to get that message out to consumers.